Three years ago German photographer Thomas Kalak published a book called Thailand – Same same, but different!. Featuring all manner of bamboo scaffolding, knotted aerial lines, hand painted signs, or converted plastic bags, the book celebrated the Thais’ exceptionally gifted art of improvisation. The strange objects and arrangements reminded Kalak of art world “ready-mades” from the beginning of the 20th century. They reminded me that salvage society is not a future prospect that will happen when peak-everything hits home. Untold millions of people subsist on the detritus of industrial society right now. 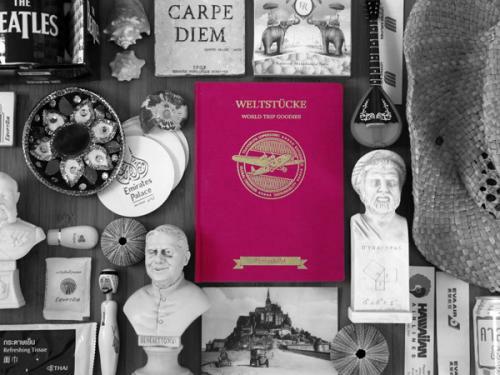 ‘Weltstücke’ features rare, bizarre, and exceptional souvenirs collected by the photographer during his ceasless travels. ‘Take nothing but memories’ Kalack concludes, and ‘and leave nothing but footsteps’. You don’t need to know how a combustion engine works to drive your car to work. Why should you need to know anything about the programming behind the pixels just to get around the web? 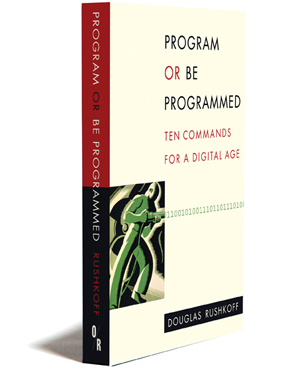 For Douglas Rushkoff, in his new book Program or be Programmed, the answer is that the web is different. I’m not so sure. Gain access to the control panel of Three Mile Island would be a better comparison. Rushkoff believes that we are moving into ‘an increasingly digital reality.’ Therefore we must learn not just how to use programs, but how to make them. But this progressive-sounding proposition is based on a dangerous assumption: that ‘digital reality’ is all encompassing, and is the only one on offer. As Jarred Diamond explained in his book Collapse, one reason societies fail is that their elites are insulated from the negative impact of their own actions. On Easter Island, the focus of Diamond’s book, the overuse of wood products eventually destroyed its inhabitants’ survival prospects. And they didn’t even notice they were doing so until it was too late. This lesson applies equally to us, today. We are bewitched, as a culture, by just one element of the world around us: its digital overlay. Thus bewitched, we waste astronomical amounts of energy and resources without even realizing it. Thus bewitched, we are destroying the biosphere upon which all life, including our own, depends. Think digitally, Rushkoff suggests, and we will be able to ‘see beyond social conventions and power structures that have vexed us for centuries’. I believe the opposite to be the case. Think digitally, and we will perceive only what the power structures want us to perceive. Doug Rushkoff is a great writer, but he needs to get out of town more. He needs to hug a tree. Shortly after my visit to Oslo I received this question from Andrea Siodmok: “what from Cornwall should the world know about?”. The director of Dott Cornwall is preparing an exhibit to celebrate the achievements of this fascinating region in south west England, and wanted me to contribute a suggestion. Andrea did not specify that the thing from Cornwall should be man-made, so I nominated the golden hair lichen. I’ve always loved lichen. I found this one in Cornwall’s Biodiversity Action Plan, and chose it as a beautiful asset that already exists in the county. The stated ambition of Cornwall, in the the far south west of England, is to become a “green peninsular”. It’s an evocative concept, but,as I wrote here, people there interpret the word “green” in different ways. My interpretation is that lichens are among the beautiful things with which the world’s ’empty’ spaces – of the kind we discussed in Norway – are filled. 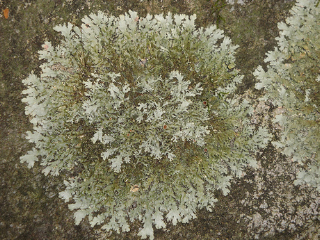 Lichen are an under-appreciated example of how a restorative economy can replace the extractive one we have now. Gunther Pauli reminded recently me that mining – which played a big part in Cornwall’s economy – is one of humanity’s most brutal interventions. Armed with dynamite, and consuming massive amounts of water and energy, we extract minute concentrations of minerals from the depths of the earth. Lichens, in contrast, are capable of extracting specific inorganic molecules like magnesium from rocks and trees – but they require zero fossil-based energy to do what they do – and leave their environment better than they found it. The most entrancing scenario for me is the idea of replacing mining with lichen. I don’t know how this might happen, but I’m convinced that lichens, including this charming one from Cornwall, have much to teach us. Oslo Airport’s mean-looking bullet train reaches the city centre in nineteen minutes. At 210 kph [130 mph] it is not the world’s fastest – some of China’a new trains will soon reach nearly twice that speed – but Norway’s is surely the most macho to look at. Traveling on Oslo’s mean-looking machine for nineteen minutes costs about 20 euros [$30). In India, by contrast, that same amount buys you a 3,500km train ride from Kashmir to Kerala. 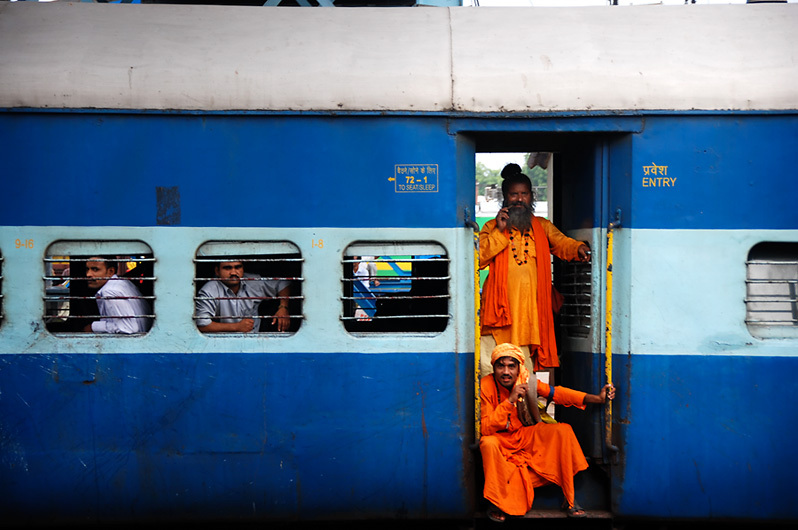 True, the north-south India trip takes three nights and four days, and the cheap carriages can be crowded. But one is bound to ask: which country has the most advanced and resilient infrastructure? My question is not rhetorical. Norway will decide next year whether or not to spend a big chunk of its oil revenue endowment on a nationwide extension of its high speed train [HST] network. I just got back from Oslo where their Architecture Triennial has opened. I participated in its main conference, Man Made Tomorrow and will report on that event soon. But ahead of the conference, Bjarne Ringstad, curator of the Triennial, asked me to reflect on how the role of such set-piece events might evolve to match the new challenges design is facing. “We are facing an array of ‘wicked problems’ that are simultaneously complex, uncertain and urgent. We have to learn how to adapt to unpredictable and possibly catastrophic disruptions to climate, financial systems, and resource flows. A single-vision, top down approach to design and planning simply does not work in the face of so much uncertainty. The new watchword is ‘adaptive resilience’ – a condition in which society, its experts, and its citizens, must learn how to adapt to change continuously. 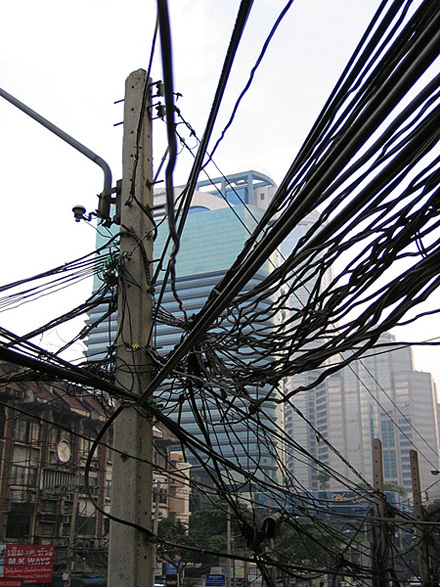 In this situation, the design focus needs to evolve from the delivery of of large-scale hard-wired solutions, towards a focus on resource ecologies, land-use, and time-use. The primary design activity, in this context, is more a conversation than the production of a blueprint. Biennials and triennials are important ways to start these new conversations. They can bring new groups of people together to imagine sustainable alternatives to the way we do things now – and then identify design actions, some of them small, that would bring these alternatives closer. 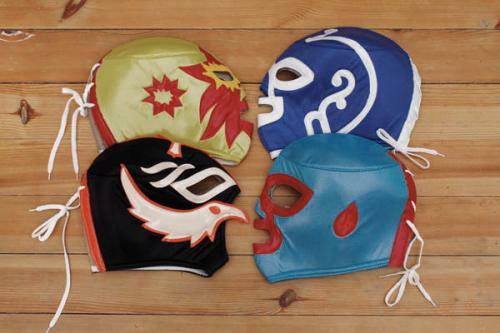 To start these conversations the content of a design biennial and the kinds of people participating, needs to change. Rather than focus on design objects or on urban ‘visions’, the focus needs to be on how, in practical ways, we will re-design the systems, institutions and processes that shape our daily lives. Sustainable development requires a system discontinuity in the way we produce, consume and socially interact. A biennial should represent – not resist – that discontinuity. 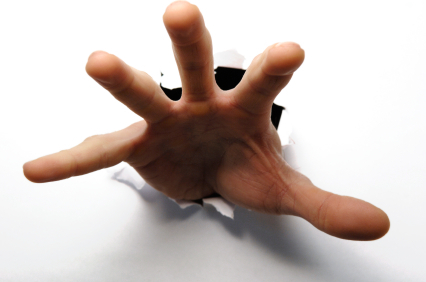 This scary hand smashing through the wall to get you is the logo of last month’s Insead conference on social entrepreneurship. Its slogan was “Reaching For Impact”. I’ve written critically here before about the assumptions that underly “design for development” – so I won’t repeat the whole argument. And as I said here we are all emerging economies now. So let’s just say that I’m troubled about the term “design for social impact” when the desired impact is on someone else’s turf, not on the designer’s own. The language of Nesta’s new “Re-boot Britain” programme also strikes me as off-key. A complex society in transition is not best imagined as a faulty machine. But both social impact, and rebooting, are thin-blooded when compared to the concept of “philanthrocapitalism” that’s celebrated in a new book. 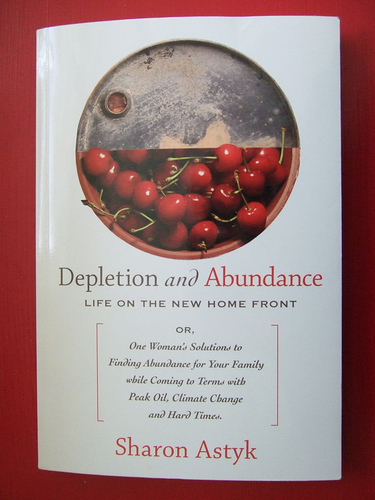 I’m reading reading a moving and important book by Sharon Astyk called “Depletion and Abundance: Life On The New Home Front”. Uniquely among recent books on life after the Peaks – energy, protein, biodiversity etc – Astyk does not write to scare us all witless. She does not write about elaborate ways to fix The Economy. She does not even furnish a shopping list of green tools and equipment that we can all buy as evidence that we are Doing Something. (This latter prohibition is a particular disappointment to Kristi and me: we’ve been compiling a shopping list of high-end fruit dryers, choucroute kits, and grain grinders, that we were about to send to our friends before Christmas). On the contrary, Astyk writes about the benefits that can come (and will come, for most of us) from being poor in material terms. She proffers practical advice on how best to live comfortably with an uncertain energy supply; prepare children for a hotter, lower energy, less secure world; and generally how to survive and thrive in an economy in crisis. This shocking approach clearly freaked out the the New York Times: they ran a patronising story in their Fashion and Style section about Astyk’s work and life. The Times even dug up a so-called “mental health professional” – a Dr. Jack Hirschowitz – who was happy to describe Astyk’s “compulsion to live green in the extreme” as a kind of disorder. Simon Johnson, former chief economist of the International Monetary Fund (IMF), told the US Congress last year that Japan’s debt path was ‘out of control’. 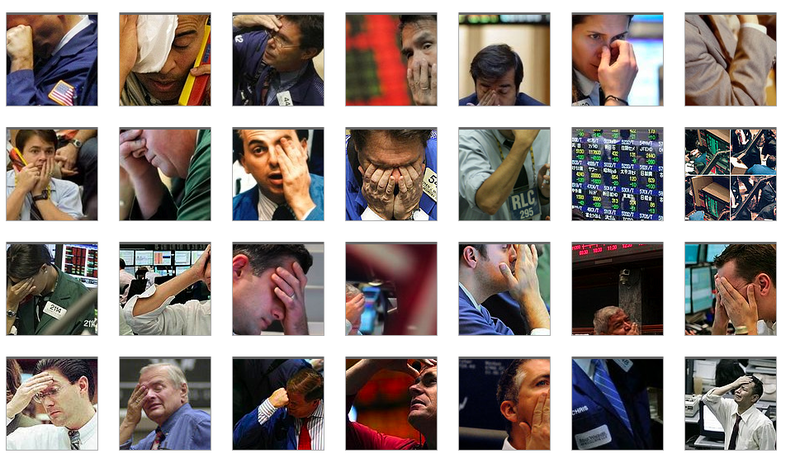 Simon warned of “a real risk that Japan could end up in a major default”. [The IMF expects Japan’s gross public debt to reach 218pc of gross domestic product (GDP) this year, 227pc next year, and 246pc by 2014]. I really don’t understand this scaremongering and negative thinking at all. Japan must be full of money, because there are so many beautiful things to spend it on. 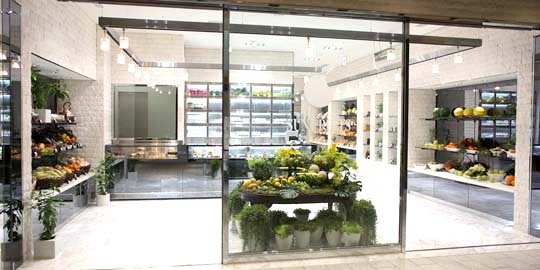 Last year, for example, I visited a gorgeous shop in Tokyo called SunFruits. In it, one of these melons was on sale for only 21,000 Yen [euros 160, US$ 233]. Now to the farmer who grew the melon, $233 might seem a bit on the high side, compared to what he was paid for it. But this is where the politics of envy so often gets it wrong. Because SunFruits don’t just sell melons, they sell a *totally designed experience*. The SunFruits shop, for example, which contained the melon, makes the average Prada store look like a charity shop. And it can’t be cheap paying for the security guard who’s there to keep an eye on the $6 strawberries. (That’s $6 each strawberry). (The guard is not in the picture because he was chasing someone who had stolen a grape). I was reminded of all all this at our market here in France today. In it, I purchased the melon below for two euros. Mine is an upscale melon hereabouts; others were on sale for half that. 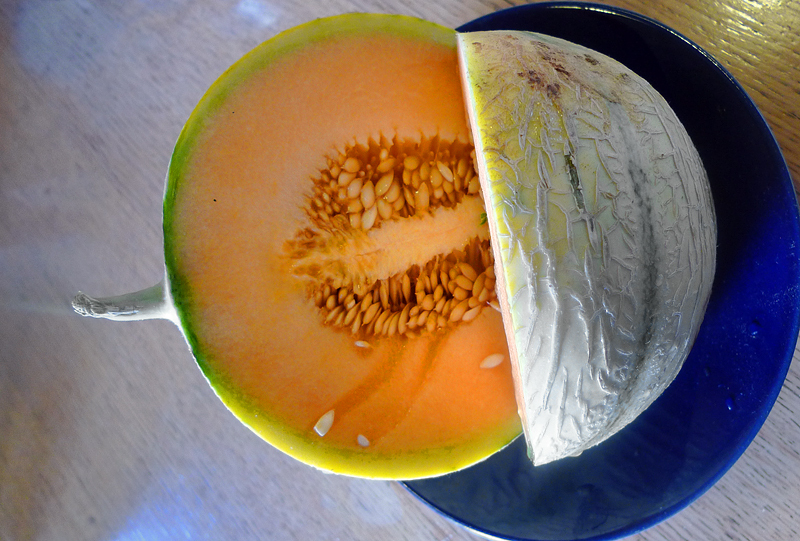 I doubt that my melon was 93 times less delicious than the melon I saw in Japan. In fact I’d bet (but cannot afford to pay for a definitive test) that my melon tastes as good or better than the SunFruits one. The only difference? mine has not been enhanced by the magic touch of of Design. The criminal over-development of the Canary Islands – and the loss of biodiversity and social capital that followed – was financed by the same banks and speculators that our governments are now trying so desperately to save. Given the desecration of these beautiful islands, the bankers who financed it all do not deserve to be saved. A more fitting fate would have them turned into biomass and returned as fertiliser to the land they have despoiled. These uncharitable thoughts are prompted by my visit this week to the second Biennale of the Canary Islands Its theme is “Silencio” – but it took me a while to get into this spirit on arrival at Tenerife’s northern aiport: builders were cutting through marble using unmuffled saws, and a massively over-amplified PA system further jangled the nerves. Away from the un-silent din of Arrivals, the scope of the biennial is impressive. 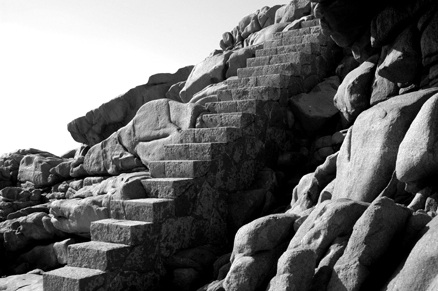 A 200-page catalogue lists dozens of events to do with architecture, art and landscape design. Many excellent and charming projects have been developed as modest interventions. But taken in total, the attitude (in writing) of the professionals is dispiriting. There are endless riffs of the kind, “the vertiginous pace of development/consumption” – but no self-criticism by designers that their profession has played an important role in all this this ecocidal development. (I do not exclude myself from the guilty, having flown in-and-out in too short a time). The biennial aspires to chart a new design course for the islands – but one would pay more respectful attention to these proposals if they were preceded by the occasional *mea culpa*. Just as films don’t get made without a script, urban development doesn’t happen without a “design vision” to inflame the lust of investors. [ The Canary Islands are not unique in this. During the now-dead boom decades, many illustrious names in design were iimplicated in awful projects. 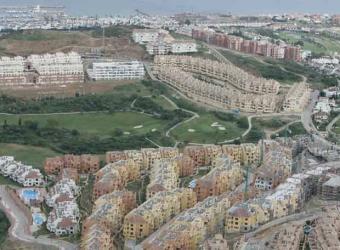 One Dubai property developer teamed up with Giorgio Armani, for example, to build a US$43 billion luxury development on two islands – Bhudal and Bhuddo, off Karachi – that government officials described as being ‘deserted’. But the livelihoods of 500,000 fishermen and their families – indigenous people who have been living on the islands for centuries – will be destroyed if the development goes ahead ].